The world is having a “Paris moment” right now: Paula McLain’s novel The Paris Wife has been well-reviewed, Woody Allen’s Midnight in Paris won the Academy Award for Best Screenplay, Gertrude Stein’s collections of modernist paintings are featured in two new exhibitions, and David McCullough’s historical study of “Americans in Paris” is generating a great deal of press. 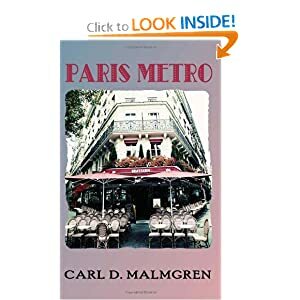 Before all of that, author Carl Malmgren published Paris Metro, a novel that captures the “Paris moment” and the spirit of Paris in the twenties. Anyone who enjoyed the writings of Hemingway and Fitzgerald will undoubtedly fall in love with Paris Metro, which brings the authors, their times, and their characters back to life. It is a novel that is both fun and literary, interweaving a page-turning plot with compelling characters and themes that are familiar to readers of the literature of the 1920s. Malmgren’s novel depicts the glamour, spirit, and decadence of the “lost generation” and at the same time purports to solve the unsolved murder from Fitzgerald’s Tender Is the Night. For anyone who loves great storytelling, Paris Metro is not to be missed.